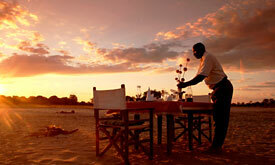 Classic Luangwa Safari enables guests to experience the best the bountiful South Luangwa has to offer. You enjoy two nights in Chinzombo followed by eight nights in our remote bush camps (generally two nights in each camp). You will be met at Lusaka Airport and escorted onto your domestic flight to Mfuwe, a flight of just over 1 hour. 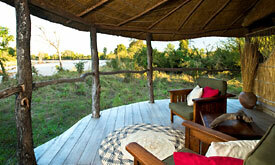 Your safari guide will meet you at Mfuwe Airport and drive you the lodge to settle in and recover from your journey. In the afternoon you’ll have a game drive and after sundowners you’ll search for nocturnal species such as genet, civet, porcupine and honey-badger, rarely seen in daylight hours. Return to camp at around 7:30pm in time for dinner. 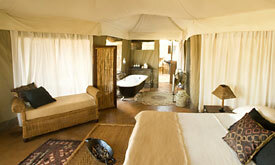 After two nights at Chinzombo you will be driven deep into the National Park to Luwi Bush Camp. 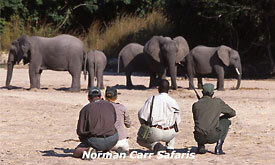 Your first night is likely to be accompanied by the noises of the wildlife around camp. When day breaks and after a light breakfast around the camp fire, you will head out on foot to pick up the fresh tracks of a pride of lion or investigate the alarm calls of the local troop of baboon. This is no nature trail – this is the real thing – you are tracking big game through the African bush, on foot like the first Luangwa pioneers. The next move takes you further down the Luwi River, again on foot or by 4×4 game viewer if you prefer, to its confluence with the main Luangwa River and to Kakuli Camp. 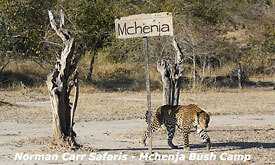 There are more game viewing tracks in this area so it is possible to use vehicles as well as explore the area which is famous for its high population of leopards on foot.